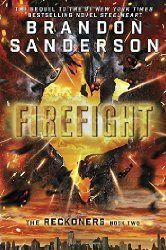 Brandon Sanderson, the #1 New York Times bestselling author of Words of Radiance, coauthor of Robert Jordan’s The Wheel of Time series, and creator of the internationally bestselling Mistborn trilogy, presents the second book in the Reckoners series: Firefight, the sequel to the #1 bestseller Steelheart. The followup to Brandon Sanderson's Steelheart finds the Reckoners now in charge of the city of Nercago, but David feels they need broaden their influence, so they set their sets for Babylon Restored, what was once Manhattan. There they take on the High Epic Regalia and her hang of thugs, both Epic and human. David searches for answers to questions that the fall of Steelheart left him, while at the same time trying to figure out what Reglia's larger plan is for the city. As much as I enjoyed Steelheart, I enjoyed Firefight even more. The twists and turns of the story were great, and as more answers to what the Epics actually are are answered, the more I want to know about the final outcome of the story. Will definitely be reading Calamity when it is released.